Could Microsoft's Cortana have coffee with Apple's Siri? Track down a curry with Google Now? The short answer is: Yeah. Supposedly, that last sentence was the exact quote Julie Larson-Green, Microsoft's chief experience officer, gave to reporters who met with her at the company's Redmond, Wash. headquarters, about the possibility that Cortana could move to other platforms. When asked to comment about Cortana's moving to Android and iOS, a Microsoft spokesperson responded: "We are not disclosing details about future releases, but we continue to explore ways to provide the great functionality of Cortana to more Windows users." Android's not exactly Windows, but whatever. We've certainly seen enough evidence that Microsoft isn't shying away from bringing its products and services to other platforms—the Office for Android preview is just the latest example. And Microsoft has gone down this road before: Marcus Ash, the group program manager for Cortana, said this past summer that Cortana would likely move to Windows. A day later, he suggested that there were "thoughts" or "suggestions" that Cortana could move to other platforms, but there were no plans at the time to do so. Porting Cortana to iOS would require Apple's permission, and access (somewhat limited, presumably) to the user data stored on the phone. Google's Android is a lot less restrictive: If you load the Bing app onto it, for example, it can automatically reroute voice searches on Android into the Bing app environment. Nevertheless, it's entirely possible that Apple or Google might try to block Microsoft from porting Cortana to either platform. (Here's another possibility: Fans of both Android and iOS would prefer their "own" digital assistant anyway). Microsoft hasn't confirmed (or denied) Cortana's plans to travel elsewhere in the mobile universe. 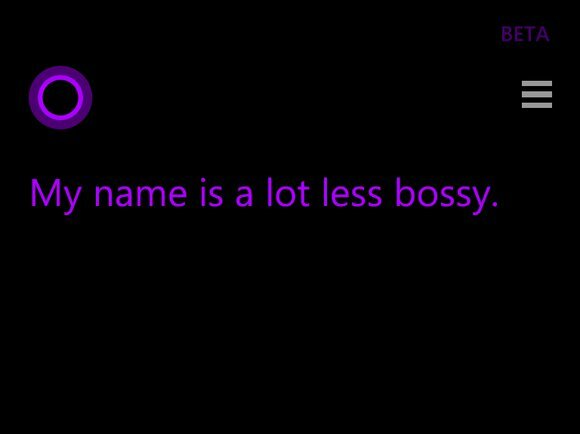 But with Cortana talking trash about her competing digital assistants, don't expect them to roll out the welcome mat. Why this matters: It would be an undoubted coup for Microsoft to say Cortana was available on other platforms, and such a coup could extend Cortana's user base enormously. But the quality of Google's Google Now makes Cortana a tough sell on Android, and many Apple users, we suspect, are still a bit leery of anything with Microsoft attached to it.